For years right-wing critics – Israeli and American, inside and outside Congress – have maligned President Obama for supposedly failing to sufficiently defend and support Israel. 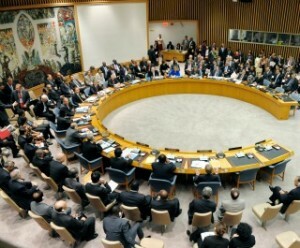 In particular, they have warned that if President Obama were to allow the United Nations Security Council (UNSC) to pass a resolution criticizing objectionable Israeli policies, or a resolution weighing in on the solution to the Israeli-Palestinian conflict, it would be an unprecedented betrayal of Israel – a betrayal that a true friend of Israel would never consider, let alone permit. Now, the truth is finally out – in this op-ed in the New York Times, by APN Director of Policy & Government Relations Lara Friedman. And the truth is: President Obama is the only president since 1967 who has shielded Israel 100% from critical resolutions in the UNSC. As a true friend of Israel, it is time for President Obama to stop shielding Israel in the UNSC, just as his predecessors in the Oval Office – Republican and Democrat alike – did numerous times over the past 48 years. It is time for President Obama to allow – and even better, to actively lead and support – action in the UNSC to preserve and support the achievement of a two-state solution in the near future. Tell President Obama you want him to support constructive action for two states in the UNSC. Over the past year, President Obama has achieved historic foreign policy victories on Cuba and Iran, Now, in his final months in office, another historic foreign policy achievement is within reach: passage of a resolution in the UNSC laying out the parameters of a two-state solution, and, with greater clarity than ever before, laying the groundwork for the achievement of such a solution. Such a resolution would represent a critically important legacy for President Obama. It would renew U.S. leadership in the Israeli-Palestinian arena. It would preserve the now-foundering two-state outcome. And it would be a gift to the next president, leaving her or him constructive options for consequential bilateral and multilateral policies and actions in the Israeli-Palestinian arena, in place of the ever-worsening, politically stalemated status quo there is today. Tell President Obama: Stand up for peace and two states. Tell President Obama that initiating or backing a two-state Israeli-Palestinian resolution in the United Nations Security Council is the real pro-Israel, pro-peace policy. President Obama needs to hear from you today! PS: APN has long held a position in support of harnessing international institutions such as the UN to advance the two-state solution. Click here to see more resources from APN on this issue.